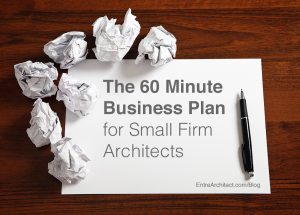 Did anyone tell you you needed to know how to run a business when you became an architect? Whether clients come knocking or not, it’s not so easy to keep them knocking. The solution is to write a business plan. This week on EntreArchitect Podcast, 60 Minute Business Plan for Small Firm Architects. 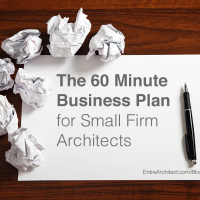 Maybe you’ve heard the words “business plan” and you feel yourself shutting down. Before you do that, let me share my vision. It came from years and years spent putting together my own various business plans. Finally, I put together a stripped down, one page version that I was able to put on paper quickly and develop as I went along. Where are you now? Where do you want to be in the future? Get a single piece of paper and write a single paragraph about your vision. What will your business look like? Where do you want to be? Do you want a high design firm? How much money are you making in your vision? What’s the big picture Consolidate that paragraph into a vision statement that embodies the essence of your vision. Why did you become an architect? Why did you launch this firm? What propels you toward your vision? Break it down into simple steps of how you’re going to reach your vision and mission. Create 5 steps and work your way backward from your end goal. What do you need to do to reach your goals? Specify benchmarks that will lead you to execute your strategies. Be specific and give yourself a deadline for each. Commit to an action plan. What tasks will you complete to accomplish your goals? Who will work toward each goal? What does the time line look like? Find the steps required to reach your goals. Everything you need will go into this document. Once you’ve finalized your business plan, revisit it often. Revisit and revise your business plan 2-4 times a year to ensure that each piece is still relevant. This is an evolving document, and that’s okay! These periodic revisiting of your big ideas keeps you focused and wanting to push your firm further. What’s your vision for your architecture firm? Enrollment for the EntreArchitect™ Academy closes Friday, October 6, 2017!